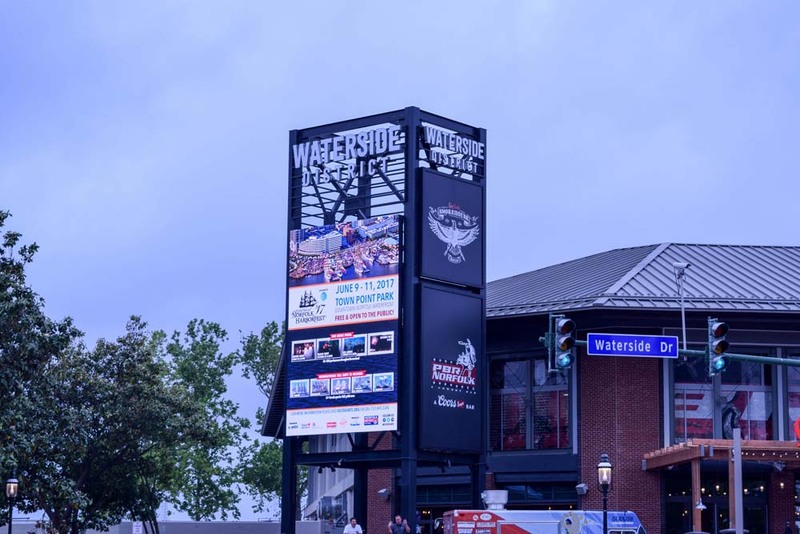 Sansi North America (SNA) Displays provided two S|Video™ LED displays for the revitalized Waterside District in Norfolk, Virgina. Located in the heart of Norfolk’s central business district and next to the city’s world-class waterfront along the banks of the Elizabeth River, Waterside District is the area’s newest dining and entertainment experience. SNA Displays manufactured two large LED displays which were installed onto separate, custom-built towers at opposite ends of the Waterside property. Both exterior video screens employ a 10 mm pixel pitch and utilize surface-mount device (SMD) pixel packaging technology. Each display measures 22’10” high by 15’8” wide and has a resolution of 696 pixels high by 480 pixels wide. Other companies involved in the project included Cordish Companies, the real estate development firm, and Sullaway Engineering, a full-service engineering company tasked with handling the screens’ structural engineering. The outdoor 10 mm LED video displays employ surface-mount device (SMD) pixel technology, where the LEDs in each pixel are packaged together, allowing for crisp, clear imagery and a widened viewing experience. Sansi continues to provide an industry-leading array of interior and exterior products offered with SMD packaging technology.